Upper Stony Creek in Sunshine North is being transformed from a concrete channel into an accessible urban wetland and park. The Upper Stony Creek Transformation Project will rehabilitate a 1.2 kilometre section of the Upper Stony Creek utilising an $11.35 million investment. It is expected to be completed in September 2019. The Clean Air and Urban Landscapes Hub have produced this infographic pamphlet to communicate about this transformation project happening in Melbourne's west. 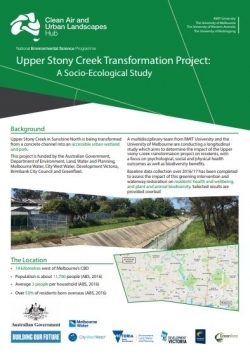 It presents some selected ecological and social findings of a joint RMIT and University of Melbourne study aiming to determine the impact of the Upper Stony Creek Transformation project on residents. For more information please contact Cecily Maller from Clean Air and Urban Landscapes Hub.